I'm pleased to announce that I'm offering the following classes and demos. I’m super excited to facilitate this fun and informative event at Fit-n-Firm in Hillsborough, NJ. This is an AWESOME learning and TASTING experience you don’t want to miss!!!! If you have never tasted FRESH almond milk, have no clue about the endless possibilities in using Young Thai coconuts, are lactose intolerant...join us! If you’d like to explore ways to create Dairy-free DECADENT, DELICIOUS, AND NUTRITIOUS treats, or you just want HEALTHIER OPTIONS.... DEFINATELY, PLEASE JOIN US! Bring a notebook as this will be fun and very informative. Recipes will be dairy and gluten-free, and completely plant-based. We will learn how to select and care for nuts, how to open a young Thai coconut, and create a rich, decadent pudding. We’ll also cover how to build, a basic smoothie. Once you taste fresh almond milk, you’ll never willingly drink store bought again! Is your family addicted to soda? What if you could offer them an alternative? Between chemical preservatives, artificial sweeteners, and the rising cost of these toxic beverages, wouldn't it be nice to offer your family a healthy alternative? For a minimal cost, you can create Water Kefir - an amazing probiotic beverage that is light, fizzy and reminiscent of soda/pop. In this hands-on class you will learn to create your own bubbly in a variety of flavors. (Ginger ale, black cherry, peach, rum raisin, blackberry, cranberry, lemon/lime, mango, licorice, and even chocolate, etc). I will walk you through the process from start to finish. Learn how to share the fabulous FIZZ of Water Kefir with your loved ones. Each attendee will receive a Water Kefir Starter Kit to make their own. Starter Kit. You Get - 4 Tablespoons water kefir grains,11 page instruction eBook, 1/4 cup organic sugar mix for 1st ferment, (1) plastic mesh strainer, 1.5 liter glass Fido jar, (1) glass swing-top bottle, (1) sample Medicine Flower extract, 1Tablespoons raisins for 2nd ferment, and a LOT of tasting. (Additional accessories available for purchase). More Info. 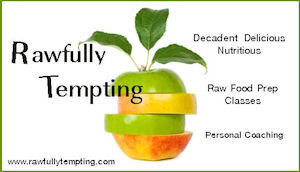 Would you like to enlighten your clients, friends and/or family on the benefits of raw food, and give them an opportunity to actually taste how decadent, delicious and nutritious they can be? 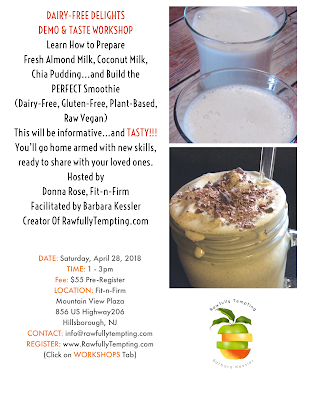 Let's get together and I will introduce the basics - how to make almond milk (nut milks), coconut milk, green smoothies, creamy puddings, savory soups, and if there is time, get to sample some delicious probiotic water kefir. Tuition: $55.00/person. Food included. Contact for details. Larger groups may be arranged at additional cost. *Additional facility charge may apply. Where to start? Why raw? What ingredients do I need? Where do I find them? What equipment do I need? How do I begin to transition from SAD (Standard American Diet) to raw? We'll cover all of these issues and more. I'll give you guidelines to get you started with simple smoothies, nut milk, soup, pates, gourmet salad, and dessert. There will be some hands-on participation, but it may be limited due to amount of information we need to cover, and size of class. Throw a cocktail party for your friends with smoothies and more. Includes: Instruction, ingredients, breakfast smoothie, samples, recipe handout and product information. Contact for details. *Additional facility charge may apply. Intermediate - Let's Get UnCooking! Already have some experience? Roll up your sleeves and let's get uncooking! Select 3 categories from Breakfast, Salads, Soup, Appetizers, Main Course, Desserts, or (Chips, Bread and Crackers). Class will involve hands-on participation that will be divided among the group.Walk away from this class feeling confident to go home and begin to create some yummy treats. This class is small and intimate so you get a lot of hands on experience! Includes: Instruction, ingredients, breakfast smoothie or light lunch, samples, recipes and product information pertaining to class. *Additional facility charge may apply. Contact for details. *What would you like to focus on? "Appetizers," "Main Course?" A La Carte classes can be on almost anything. Get a group of friends together, and we can create a special class or series of classes customized to your needs. Host a class with 6 or more people and get class free. (Does not include Water Kefir supplies). Select from one below: or create your own a la carte class. Nut milk, cream soup, green smoothies, fruit smoothies, pudding, super foods, extracts, sweeteners, etc.We will cover a wide variety of ingredients to help you create blendables that are decadent, delicious AND nutritious. (Demo and hands on). Includes: Instruction, ingredients, smoothies, smoothie recipes and resources. *Additional facility charge may apply. Contact for details. Is your family addicted to soda? What if you could offer them an alternative? Between chemical preservatives, artificial sweeteners, and the rising cost of these toxic beverages, wouldn't it be nice to offer your family a healthy alternative? For a minimal cost, you can create Water Kefir - an amazing probiotic beverage that is light, fizzy and reminiscent of soda/pop. In this class you will learn to create your own bubbly in a variety of flavors. (Ginger ale, black cherry, peach, rum raisin, blackberry, cranberry, lemon/lime, mango, licorice, and even chocolate, etc). I will walk you through the entire process from start to finish, including how to maintain your grains. Learn how to share the fabulous FIZZ of Water Kefir with your loved ones. Each attendee will receive a Water Kefir Starter Kit to make their own. Includes: Complete Starter Kit. You Get - 4 Tablespoons water kefir grains,11 page instruction eBook, 1/4 cup organic sugar mix for 1st ferment, (1) plastic mesh strainer, 1 liter glass Fido jar, (1) glass swing-top bottle, (1) sample Medicine Flower extract, 2 Tablespoons raisins for 2nd ferment, and a LOT of tasting. (Additional accessories available for purchase). *Additional facility charge may apply. Contact for details. Brownies, multiple layer cheesecakes, cookies, ice cream, puddings, and/or chocolate. This is the ultimate dessert class. Learn how to create some of these decadent treats that will satisfy any sweet tooth and help you transition to healthier eating. Get off refined sugar and still enjoy these fabulous foods! This class is small and intimate to allow for a hands-on experience. Includes: Instruction, ingredients, samples, recipes, and product information *Additional facility charge may apply. Contact for details. Savory is Something! Soup, Salad and Pastapaloozah! Includes: Instruction, food, samples, recipes, and product information *Additional facility charge may apply. Contact for details. Have you been worried about where to shop and what to buy? Let's go shopping together! I'll go with you to your local market and help you select the highest quality products for a raw food lifestyle. We can also go over online resources for items that are not available locally. Eliminate the worry and allow yourself to move forward into this lifestyle with ease. Bring a friend or two to join in the fun! Not comfortable in a group setting and prefer one-on-one attention? Do you already have some experience and want to take it to the next level? Whether you are a beginner or novice, if there is something specific you would like to learn, we can customize this private class to meet your individual needs. Duration: Minimum 3 hours, up to 6 hours. Tuition: $150 per hour for up to 2 people. Save $$ - Add a 3rd friend @ $60/hr and save. Example for 3 hour class - $480 (for 2) + $180 (for 3rd friend = $660. Divded by 3 friends = $220/person. Class Includes: One-on-one, hands-on instruction, samples, recipes, some ingredients, and list of product resources relevant to instruction. *Additional facility charge may apply. Additional charge for produce and other food items. Contact for details. Experimenting on your own and need some guidance? Would you like assistance with your transition into raw, help planning meals or preparing meals, or finding ingredients? This can be a general, overall topic, or a very specific one, like "How to Make Water Kefir." I'm available for phone or skype consultations. Let's customize a consultation that meets your needs and get you headed in the right direction! Tuition: $100 - Up to 1 hour phone/skype or chat consultation. After I receive your registration info, I will contact you with possible dates and times to set up your customized consultation I'm looking forward to working with you! Contact for details. I offer instruction in New Jersey. Fee includes the instruction and travel expenses (up to 25 miles from Hillsborough, NJ). Additional travel costs for areas outside this range will be added accordingly. I have known Barbara for about five years now both personally and professionally, Barbara is a Master at her craft. Her organization skills and attention to detail are like to other. Her fun loving spirit and communication style make her so easy and enjoyable to be around. Over the years I have learned much from Barbara and have a great respect her creativity and style. Just attended Barbara's water kefir workshop yesterday and it was fun, informative, and very clear. Brought my 1st and 2nd fermentation batches home and today I (properly) burped the 2nd fermentation batch, added some orange and my kids and I all drank it. Feels good to drink something delicious and so healthy for you! Thanks, Barbara for supporting and guiding us through the process. Feels like I can totally handle making this at home for years to come! Thanks, Rita....so glad you enjoyed the class, and that your family is enjoying the Kefir!!! Yay! I can’t wait to hear some of the other fun things you come up with.